There is beauty all around us! 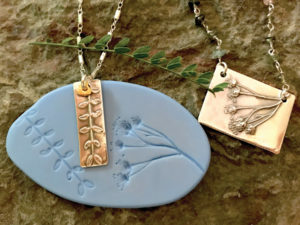 Learn how to capture the essence of organic materials by making molds of them, that can be used over and over again! You will be amazed by the details that are revealed. Once your mold has cured, you will be using it to create your unique pendant! Pieces will be torched in class, and finished off with a patina to bring out the details even more. Bring in your own organic pieces or use one of the available botanicals that will be provided in class. Fee includes 2-part mold, enough for one impression. 7g Art Clay Silver can be purchased in class for an additional $21.75. *Prerequisite Let’s Play with Metal Clay Intro. Please call us at 626-529-2863 to register.